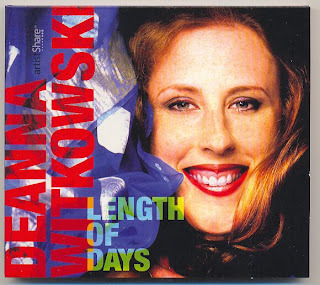 Jazz Station - Arnaldo DeSouteiro's Blog (Jazz, Bossa & Beyond): CD of the Day - "Deanna Witkowski: Length of Days"
CD of the Day - "Deanna Witkowski: Length of Days"
Nice originals (the sensual opening track, "Beautiful Hands," reveals the strong influence of Eliane Elias) and creative renditions of such tunes as "Hi-Lili, Hi-Lo," "Straight, No Chaser," "In The Still of The Night" and specially "I'm Beginning To See The Light" (done in a delightful afro-cuban groove) make this album by NY-based pianist/vocalist Deanna Witkowski a highly recommended item. She's supported throughout the session by Dave Ambrosio (bass), Vince Cherico (drums) & Donny McCaslin (sporano & tenor daxophones). I just found your blog, and your review! Thanks so much. I have a new disc, "From This Place," that is officially being released on April 7. Let me know if you'd like a copy- you can reach me via my site at http://deannajazz.com. Vc é brasileiro, né? Espero que no ano que vem possa gravar um disco da música brasileira.